Review posted August 8, 2017. DAW Books, 2014. 159 pages. This book is set in the world of Patrick Rothfuss's Kingkiller Chronicle, a short tale of Auri, a mysterious girl who lives deep under the University in dark passages. In the Author's Foreword he tells you right up front this isn't the best introduction to his worlds, and includes other reasons you might not want to read it. I think it's only fair to warn you that this is a bit of a strange story. I don't go in for spoilers, but suffice to say that this one is . . . different. It doesn't do a lot of the things a classic story is supposed to do. And if you're looking for a continuation of Kvothe's storyline, you're not going to find it here. On the other hand, if you'd like to learn more about Auri, this story has a lot to offer. If you love words and mysteries and secrets. If you're curious about the Underthing and alchemy. If you want to know more about the hidden turnings of my world. . . . He said it! 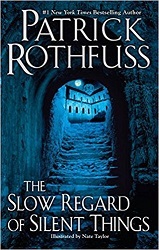 Patrick Rothfuss's astonishing ability to write beautiful language is still evident in this book -- but this isn't where you'll see his ability to craft a plot. But if you already love his world, here's an opportunity to spend some time there, and to get inside the mind of the mysterious and broken Auri as she goes about her interesting hidden world, putting things in their proper places.